A generous 3 oz. 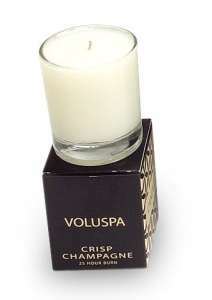 votive candle in an oversized Luxe glass. Filled with superior quality, cool burning wax that will burn for over 25 hours, easily scenting a medium sized room. Crisp Champagne combines sparkling dry champagne with a hint of fruity ginger. Tonka Bean and Tabac add soft Vanilla notes creating a subtle warm finish. The scent of this candle fills the room in minutes! It is almost instantly relaxing. Very soothing. This candle burns very evenly, so I dont really have to worry about the sides melting onto the wick and putting out the flame like with other candles I have tried.